Stuffing boneless chicken breast with your favorite ingredients is an easy way to turn an ordinary meal into something special. I found the recipe below on SkinnyTaste.com and let me tell you it's spectacular. I added a side of broccolini to round-out the meal, but you can pair it with just about any vegetable. 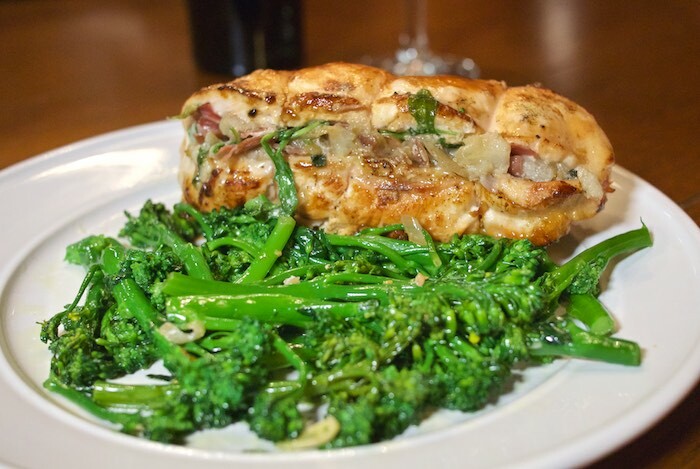 Family and friends are sure to be impressed specially when you tell them that it took just under an hour to get this delicious stuffed chicken dinner on the table. Preheat the oven to 375°F degrees. Slice a pocket into the side of the chicken breast lengthwise to create a pocket for stuffing. Season the inside and outside of the chicken with salt and pepper. Heat a skillet of medium heat, add the oil and proscuitto; saute 3 to 4 minutes. Add the sage and pear, season with a pinch of salt and cook 3 to 4 minutes. Remove from heat, and add the arugula. Set aside to cool a few minutes. Divide the stuffing and fill each breast with the pear filling and brie. Cut cooking twine and tie the chicken breast closed with 3 pieces for each. Heat an oven-proof skillet over medium-high heat and add some olive oil. Carefully sear the outside of the chicken on all sides except where the stuffing is until golden brown. Set the chicken cut side up and place the skillet in the oven (if you don’t have an oven-proof skillet place in a baking pan). Cover the skillet tightly with foil and cook 23 to 25 minutes, or until the chicken is cooked through. Serve with your favorite vegetable side-dish. This looks delicious, I might try and make it!